My husband is a HUGE mint fan, so I recently made these Flourless Peppermint Chocolate Cookies for him. They were a huge hit and they only take a few minutes to make. You may also like my flourless chocolate muffins or my flourless brownies. Not only are these cookies filled with peppermint chocolate goodness, but they also come with a secret ingredient that will give you a healthy boost of protein and fiber! 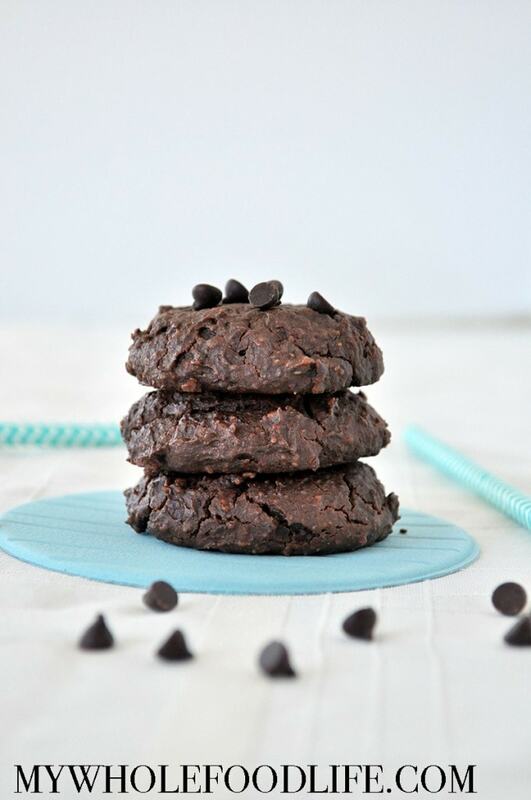 These Flourless Peppermint Chocolate Cookies are vegan, gluten free and grain free. They only contain a handful of healthy ingredients! These healthy cookies come with an extra boost of protein and fiber! 3/4 cup nut butter of choice (I used almond butter) Not sure if peanut butter would be a good sub since it has such a strong flavor. In a food processor , combine all the ingredients. Mix well. If the batter looks a little too wet, stick the bowl in the fridge for 20 minutes. Using a cookie scoop , drop cookies onto a lined baking sheet . Let cool before removing from the baking sheet. These should last at least 7-10 days in the fridge. You can also freeze them for longer storage. Enjoy! do you add cocoa powder as well? If so, how much do you recommend? Thanks! Thanks! I was just looking at my printed recipe with no chocolate - LOL - so glad I came back to check it! How do you know these cookies will last 7-10 days. I mean.... are you seriously telling me that you haven't eaten them all up by that point?